Zoë Wanamaker as Stevie Smith and Lynda Baron as Aunt. Photo by Manuel Harlan. Originally staged in 1977, six years after her death, Hugh Whitemore’s biographical play is an affectionate portrait of the quirky north London poet Stevie Smith. The titles of her much anthologised poem ‘Not Waving but Drowning’ and of her first volume A Good Time Was Had by All have entered our language, and during her lifetime she attained considerable celebrity for her accessible, finely-observed verse that mixed droll humour with an awareness of mortality. Despite her success, she led a quiet, routine-bound existence, working as a secretary for a publishing company in the West End, while spending almost her whole life with her maiden aunt in the same house in suburban Palmers Green. Although Whitemore, best known for his theatre and TV plays about historical figures such as Alan Turing and Winston Churchill, creates a convincing account of Stevie’s eccentric insecurity, this character study rarely springs to life on stage. After the abandonment of her father and the death of her mother when still a child, she became emotionally dependent on her ‘lion aunt’, preferring the domesticated pleasures of sherry and Battenberg cake, with the occasional literary soirée, rather than committing herself to any romantic relationship. While Whitemore cleverly interweaves extracts from her poems to show their autobiographical roots, he fails to make Stevie’s self-imposed seclusion dramatically interesting. A lot of the play is actually monologue, as Stevie tells the story of her life to the audience, sometimes abetted by her aunt and a totally unnecessary male narrator who hovers awkwardly on the fringes, with very little conflict enacted. Christopher Morahan’s sedate production, first seen at the Chichester Festival last year, conveys the idiosyncrasy of Stevie’s voice without ever persuading us that this work would lose anything by being produced on radio. Simon Higlett’s remarkably detailed design of a comfortable middle-class home in the suburbs, with piles of books and trees in the garden, almost seems to be a substitute for the lack of action that takes places within it. 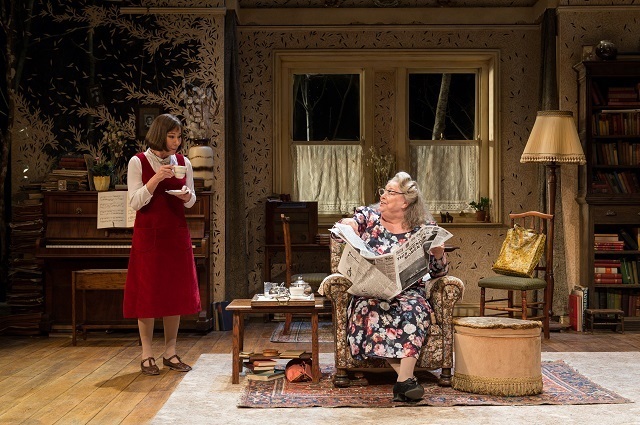 Zoë Wanamaker does her best to save the play by fully inhabiting the title role originally played by Glenda Jackson, capturing both the humour and the pathos of Stevie’s situation with her whimsical insights undercut by a sense of quiet desperation. Wanamaker is supported by Lynda Baron as her down-to-earth, no-nonsense aunt and Chris Larkin who has cameos as a spurned fiancé and an exasperated friend as well as playing the redundant narrator of a rather dull story. Stevie is on at the Hampstead Theatre until 18 April. Tickets are £18–£35. Londonist saw this production on a complimentary ticket.